I bought this receiver used almost 8 years ago. I just use it for 2 channel music at this time and I have been very pleased with it. The only problem I have is that the volume knob does not work anymore but with a remote I don't really need it. I only paid 200 dollars for it and at that price it was a steal. Looks good and produces great music at all levels. Pre-out jacks if you need an outboard amplifier for tough speaker loads. I have not run into that problem and am very happy with the output power. My speakers impedance is 8 ohms so I can't tell you if it would be adequate for 4 or 6 ohm speakers. this is a great receiver all around.I had this unit for about five years and never had any problems with it and i never had to have it repaired. im using infinity speakers and the inifinty ps12 sub woofer that really brings out the lows. I belieave if any one by this receiver and use the right settings they will also love it . thank you sony. Nice all in one unit. Doesn't seem to like less than 44.1khz audio, amp quality is not high end. Fairly good for my purposes, but not a magic bullet that suits all needs without a little outboard amplifier help. I had hoped that after hearing my friend's 1000ES model receiver that it would be good enough so I could leave my rack mount amplifier and processor stack behind me as it just takes up so much room and with the prospect of moving the enormous weight of these things has me wanting somthing smaller and more portable. Sadly, the technology has NOT arrived to use onboard amps on a receiver apparently without risking a little bleeding ear syndrome with some recordings. What I love about my old setup with the carver A-760x powering my Carver Amazing Platinum IV speakers is that music I HATE on other systems actually sounds smooth and pleasant and just makes me want to rock out when played on that. Motley Crue just sounds harsh and nasty to me and I never liked it growing up-until I heard it on my Carver setup with a seperate preamp. So after hearing my friend's receiver, and after reading these reviews, I decided to take the risk and see if it would really work out. It sounded ok on my friend's setup, but then he's using big, old box speakers of some variety and I'm using ribbon speakers. It's a good thing this Sony has preamp RCA outs, because I'll be using an outboard amp for the mains and I'll probably use the onboard amps for the center and surrounds for movie watching where listener fatigue is a smaller issue than with music to me. I also haven't figured out how to get the Sony to decode sampling rates of less than 44.1khz from my PC, and that's a disappointment if it turns out to be incompatible with odd rates like my old decoder was. This is a good unit, but don't give Sony more credit than they are due because they need to keep improving this technology until I can finally just use one box for everything (keeping my fingers crossed). I can now happily listen to my music twice as loud without any listener fatigue and now it makes me want to sing and dance along with it. I love that with a good setup my tastes range from classical to most any kind of rock or pop. If I use worse equipment, I like fewer kinds of music, and I don't want to give up the variety that I have now with having so much that just sounds GOOD! Enjoy, but beware thinking it will do more than it does in reality. Preout is a good thing. Fantastic sound on Music and Film. Nice looking. Remote is not very nice. Not i-link for SACD, DVD-Audio. First I'm very sorry for all people having problems with this reciver. If you buy it today, I'm shure all the problems are gone, since this was only in the early models. This is the future, the digital amp. does not get warm. One of the worst problems for electronics is heat. Digital AMPs are very effective over 90% goes to sound. Not like transitiors where round 15% goes to sound. Rest of the effect goes mostely to heat. What are the source today? for most CD and DVD. What are they? digital. So it must be best if the signal goes digital, as far as possible. This reciver takes the PCM signal on CD's upconvert them too DSD signal (what is used on SACD) and belive me CD (PCM) signal don't get bether that this. Let's go too the sound of this digital unit. First I have too say that you should not use the analog connections. You will lose a lot of image, and detail. Use Coax cable from your DVD-player of CD-player, and you will hear some of the magic, on this Digital reciver. I have used this unit for about a year, and it takes some time to set it up. One thing that blew me away was that at once you set the speakers to small, the treble and mid. goes from good, to high-end. The only prob. is that you need a good sub. to take care of the low bass. Use a sub that is good with music, like Rel.net try (REL Stampede) it will please you with all kind of music. I don't know why it sound mutch bether on the small setting, but I think it's because the AMP don't need to use energy to drive the low bass tones. If you don't have sub. and need too use large setting for you front speakers, I would go for the DA9000ES. If you use my setting. Fronts, Center, Surround, SUB. You will have the best sound you can find, for under 2500$ The reciver is powerfull, and will play very loud. Some reviewers say that it's weak. That is not true. Mabye wrong settings. I listen most too music, and you will not belive the sound that comes out of your speakers. Do you think that your speakers sound bright, or the bass sound boomy. Try this reciver, with my setting. This is the best reciver I have heard. Don't get fooled by yesterdays technology. Denon 3803, NAD T750, recivers. Arcam, Nikko, Sony, stereo integrated. Tried a lot Classe, EC, Cayin ect. unbelievable soundstage, imaging and detail. When the 3000ES works it sounds great. However, I just returned my 3rd 3000ES. 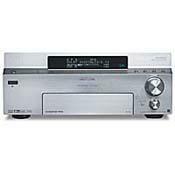 The Sony digital ES receivers (2000, 3000, 5000) have quality problems. Some seem to work but many more are defective. I received my first 3000Es in 01/04 and thought it sounded weak, and there was a lot of hiss as it was turned up. After searching the net I found out that this is a common problem to these receivers. I contacted Crutchfield and they sent me a replacement. This one worked great. The sound was so good, precise and with plenty of volume with my Polk LSi 15 (fronts), LSiC (center), and LSi 7 (rears). But after a couple of months the video started dropping out. This is another common problem with these receivers. So I again contacted Crutchfield and they sent me another one. The 3rd one had the low volume/hiss problem like the 1st unit. So, I have returned it and bought a Denon AVR-3805. Many inputs and outputs, A & B speaker chanels, can rename the sources, and ton of options. Very load humming noise. Just a problem with mine? Who knows. The Tweeter Salesman told me 5 others were awaiting repair. I picked this up as an open boxed item at Tweeter. I was inpressed with all the bells and whistle it offered and many inputs and outputs. Only one problem, after it was on for an hour or so it had this alwful hum. It came from all the speakers and I determined it to be a thermal problem. Took it back and picked up a Denon AVR-3803 (which I will exchange in a few weeks for a AVR-3805 when they arrive at Tweeter. See my review of the AVR-3803 and AVR-3805 when avilalbe. The remote is more complicated than the front-panel layered menu interface. It's best to just forget it came with a remote. Hardly something to consider a weakness, but only 2 component video inputs. The STR-DA3000ES is a very flexible receiver that is great for both music listening and home theater use. I bought the unit even after reports of the initial batches having a few problems, like a noticible noise floor hiss. I'm happy to say that the unit I have appears to have no noticable noise in the absence of audio, nor does it appear to be underpowered. Because of the digital amplification, you could turn the volume to the maximum setting without incurring any significant penalty in sound quality. In my setting, I would not reccommend it, however, since it is so deafeningly loud that it causes ear pain for everybody in the room (dimensions 22'x17'). The unit is paired up with boston acoustics for fronts, B&W for surround, and infinity for back surround and center. There is no subwoofer in this setting. One of the reasons I favored this receiver over others was the flexibility of configuration. It includes a parametric EQ on each channel, which allowed me to adjust the levels to fit my uncommon spread of speaker type and response. There are lots of features which might make this receiver a little overwhelming to the typical listener. It is, otherwise, a playground for the involved listener or audiophile. Adjusting it initially to fit the environment and speakers is an incremental process, but if you know what kind of sound you are looking for, you can probably get it or at least come very close with a little patience. The overall impression I get from the sound production is _accurate_. There are many flavors of sound coloring to choose from if one desires to try them. The most interesting of them are labelled Cinema Studio EX A,B, and C. These are virtual sound stages which can be applied to multi-channel sources, and which attempt to mimic the sound of actual sound stages which are used for multi-channel movie/effects recording. They do seem to make some sounds appear more believably present when watching movies. The receiver runs cooler than any other of my components, even the DVD player. I have enjoyed it from day 1. Pure digital, Bass detail is fatastic. Lots of detail, dynamics. Great on Music, and movies. Remote. Some hiss when played very loud. This is the future. The only thing I can say is, what does the transistor do wrong. I have tried a lot of Recivers integrated amps. Power amps. The bass definition on this unit is unique, I would not even try to guess what you have to pay to get something like this in a transistor amp. Sorry for all you folks buying transistor reciver lately. Never realy been a Sony fan, but with this unit they are far in front of any suround producer at the moment. The reciver got plent of power. My PSB silver'i is rated at 4 ohm, and is not easy to drive. The Sony plays louder that I will ever play, and I play loud!! The speaker terminals are great, the remote could have been nicer, but does the job. This must be the best looking reciver out there. If you are in for the future, go out and get it. I sold my Denon AVR-3802 2 weeks ago, and don't miss it at all. Thank you Sony, this is what I have been looking for. Suround: NAD, Denon, Yamaha. 2 chanel: Arcam, Mistal, Nikko, Doxa, NAD.